"We know from satellite observations that vegetation is greener than it was in the past," Wang said. "We now understand why that's occurring, but we don't necessarily know if that's a good thing or not." The researchers believe the greening is a response to higher atmospheric carbon dioxide inducing decreases in plant stomatal conductance—the measure of the rate of passage of carbon dioxide entering, or water vapor exiting, through the stomata of a leaf—and increases in soil water, thus enhancing vegetation growth. "The stability of the rate of change justifies using higher carbon dioxide enrichment levels to interpret soil water responses to currently observed carbon dioxide enrichment," Wang said. 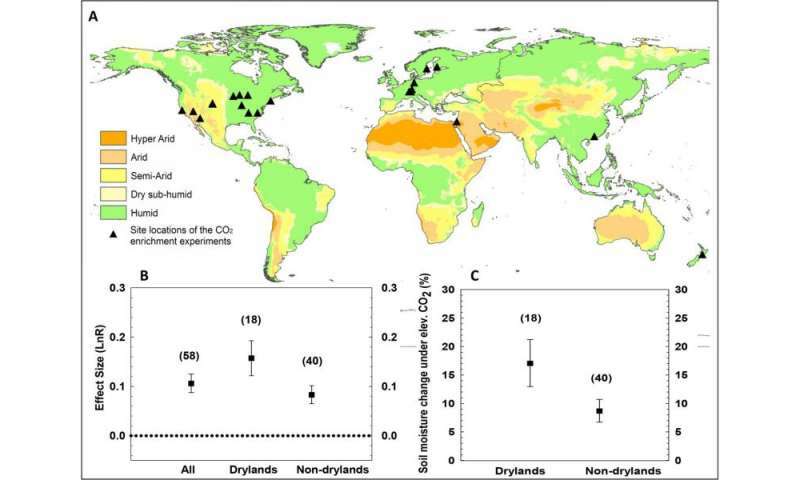 Studies including Wang's earlier work in Africa have shown that even small changes in soil moisture in drylands could be significant enough to cause large changes in vegetation productivity.